Cavernous sinus thrombosis (CST) was initially described by Bright in 1831 as a complication of epidural and subdural infections. The dural sinuses are grouped into the sagittal, lateral (including the transverse, sigmoid, and petrosal sinuses), and cavernous sinuses. Because of its complex neurovascular anatomic relationship, cavernous sinus thrombosis is the most important of any intracranial septic thrombosis. Cavernous sinus thrombosis is usually a late complication of an infection of the central face or paranasal sinuses. Other causes include bacteremia, trauma, and infections of the ear or maxillary teeth. Cavernous sinus thrombosis is generally a fulminant process with high rates of morbidity and mortality. Fortunately, the incidence of cavernous sinus thrombosis has been decreased greatly with the advent of effective antimicrobial agents. The cavernous sinuses are irregularly shaped, trabeculated cavities located at the base of the skull. 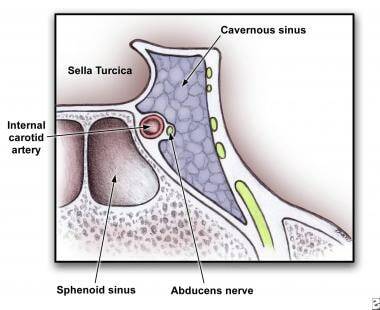 The cavernous sinuses are the most centrally located of the dural sinuses and lie on either side of the sella turcica. These sinuses are just lateral and superior to the sphenoid sinus and are immediately posterior to the optic chiasm, as depicted in the image below. Each cavernous sinus is formed between layers of the dura mater, and multiple connections exist between the 2 sinuses. Anatomy of cross section of cavernous sinus showing close proximity to cranial nerves and sphenoid sinus. The cavernous sinuses receive venous blood from the facial veins (via the superior and inferior ophthalmic veins) as well as the sphenoid and middle cerebral veins. They, in turn, empty into the inferior petrosal sinuses, then into the internal jugular veins and the sigmoid sinuses via the superior petrosal sinuses. This complex web of veins contains no valves; blood can flow in any direction depending on the prevailing pressure gradients. Since the cavernous sinuses receive blood via this distribution, infections of the face including the nose, tonsils, and orbits can spread easily by this route. The internal carotid artery with its surrounding sympathetic plexus passes through the cavernous sinus. The third, fourth, and sixth cranial nerves are attached to the lateral wall of the sinus. The ophthalmic and maxillary divisions of the fifth cranial nerve are embedded in the wall, as depicted in the image above. This intimate juxtaposition of veins, arteries, nerves, meninges, and paranasal sinuses accounts for the characteristic etiology and presentation of cavernous sinus thrombosis (CST). CST is more commonly seen with sphenoid and ethmoid and to a lesser degree with frontal sinusitis. Occurrence of cavernous sinus thrombosis (CST) has always been low, with only a few hundred case reports in the medical literature. The majority of these date from before the modern antibiotic era. One review of the English-language literature found only 88 cases from 1940-1988. Prior to the advent of effective antimicrobial agents, the mortality rate from CST was effectively 100%. Typically, death is due to sepsis or central nervous system (CNS) infection. With aggressive management, the mortality rate is now less than 30%. Morbidity, however, remains high, and complete recovery is rare. Roughly one sixth of patients are left with some degree of visual impairment, and one half have cranial nerve deficits. These mortality and morbidity rates may be due to delayed diagnosis without prompt surgical drainage and antibiotic administration. All ages are affected, with a mean of 22 years. Laupland KB. Vascular and parameningeal infections of the head and neck. Infect Dis Clin North Am. 2007 Jun. 21(2):577-90, viii. [Medline]. Seow VK, Chong CF, Wang TL, Lin CM, Lin IY. Cavernous sinus thrombophlebitis masquerading as ischaemic stroke: a catastrophic pitfall in any emergency department. Emerg Med J. 2007 Jun. 24(6):440. [Medline]. Duong DK, Leo MM, Mitchell EL. Neuro-ophthalmology. Emerg Med Clin North Am. 2008 Feb. 26(1):137-80, vii. [Medline]. Misra UK, Kalita J, Bansal V. D-dimer is useful in the diagnosis of cortical venous sinus thrombosis. Neurol India. 2009 Jan-Feb. 57(1):50-4. [Medline]. Pendharkar HS, Gupta AK, Bodhey N, Nair M. Diffusion restriction in thrombosed superior ophthalmic veins: two cases of diverse etiology and literature review. J Radiol Case Rep. 2011. 5(3):8-16. [Medline]. [Full Text]. Korchi AM, Cuvincius V, Caetano J, Becker M, Lovblad KO, Vargas MI. Imaging of the cavernous sinus lesions. Diagn Interv Imaging. 2014. 95(9):849-859. Andrews CM, Hawk HE, Holmstedt CA. Case Report: Septic cavernous sinus thrombosis. Neurol Clin Neurosci. 2014. 2:117-118. Tang Y, Booth T, Steward M, Solbach T, Wilhelm T. The imaging of conditions affecting the cavernous sinus. Clin Radiol. 2010 Nov. 65(11):937-45. [Medline]. Coutinho J, de Bruijn SF, Deveber G, Stam J. Anticoagulation for cerebral venous sinus thrombosis. Cochrane Database Syst Rev. 2011 Aug 10. CD002005. [Medline]. Coutinho JM, Ferro JM, Canhão P, Barinagarrementeria F, Bousser MG, Stam J. Unfractionated or low-molecular weight heparin for the treatment of cerebral venous thrombosis. Stroke. 2010 Nov. 41(11):2575-80. [Medline]. Naesens R, Ronsyn M, Druwé P, Denis O, Ieven M, Jeurissen A. Central nervous system invasion by community-acquired meticillin-resistant Staphylococcus aureus. J Med Microbiol. 2009 Sep. 58:1247-51. [Medline]. Bhatia K, Jones NS. Septic cavernous sinus thrombosis secondary to sinusitis: are anticoagulants indicated? A review of the literature. J Laryngol Otol. 2002 Sep. 116(9):667-76. [Medline]. Canhao P, Ferro JM, Lindgren AG. Causes and predictors of death in cerebral venous thrombosis. Stroke. 2005 Aug. 36(8):1720-5. [Medline]. Cannon ML, Antonio BL, McCloskey JJ, et al. Cavernous sinus thrombosis complicating sinusitis. Pediatr Crit Care Med. 2004 Jan. 5(1):86-8. [Medline]. DiNubile MJ. Septic thrombosis of the cavernous sinuses. Arch Neurol. 1988 May. 45(5):567-72. [Medline]. Ferro JM, Canhao P, Bousser MG. Cerebral vein and dural sinus thrombosis in elderly patients. Stroke. 2005 Sep. 36(9):1927-32. [Medline]. Goodwin WJ. Orbital complications of ethmoiditis. Otolaryngol Clin North Am. 1985 Feb. 18(1):139-47. [Medline]. Heckmann JG, Tomandl B. Cavernous sinus thrombosis. Lancet. 2003 Dec 13. 362(9400):1958. [Medline]. Karlin RJ, Robinson WA. Septic cavernous sinus thrombosis. Ann Emerg Med. 1984 Jun. 13(6):449-55. [Medline]. Lessner A, Stern GA. Preseptal and orbital cellulitis. Infect Dis Clin North Am. 1992 Dec. 6(4):933-52. [Medline]. Levine SR, Twyman RE, Gilman S. The role of anticoagulation in cavernous sinus thrombosis. Neurology. 1988 Apr. 38(4):517-22. [Medline]. Peters KS. Secondary headache and head pain emergencies. Prim Care. 2004 Jun. 31(2):381-93, vii. [Medline]. Schnipper D, Spiegel JH. Management of intracranial complications of sinus surgery. Otolaryngol Clin North Am. 2004 Apr. 37(2):453-72, ix. [Medline]. Southwick FS, Richardson EP, Swartz MN. Septic thrombosis of the dural venous sinuses. Medicine (Baltimore). 1986 Mar. 65(2):82-106. [Medline]. Watkins LM, Pasternack MS, Banks M. Bilateral cavernous sinus thromboses and intraorbital abscesses secondary to Streptococcus milleri. Ophthalmology. 2003 Mar. 110(3):569-74. [Medline]. Yanofsky NN. The acute painful eye. Emerg Med Clin North Am. 1988 Feb. 6(1):21-42. [Medline].